Charlotte Writers' Club's MOST PRESTIGIOUS AWARD! Open to all CWC members and to non-member residents of North and South Carolina. Entries must be an original and unpublished. This includes blogs, Facebook, websites and any other digital media. Fiction story between 1500-4000 words. Please follow guidelines in General Manuscript Requirements, Eligibility & Submission Information. Prizes will be awarded in May at the CWC general meeting. First place: $250.00, Second place: $150.00, Third place: $50.00. For inquiries or questions, contact Tony Ricciardelli, Contest Chair. 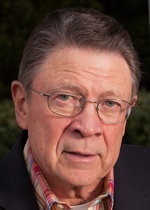 Novelist, screenwriter and playwright Robert Inman is a native of Elba, Alabama where he began his writing career in junior high school with his hometown weekly newspaper. He left a 31-year career in journalism in June, 1996 to devote full time to creative writing. Inman's fifth novel, The Governor's Lady, was published in 2013 by John F. Blair Publishers. He is also the author of Home Fires Burning (1987), Old Dogs and Children (1991), Dairy Queen Days (1997), and Captain Saturday (2002), all published by Little, Brown and Company, and currently available in e-book editions. Three of his novels were chosen as "Booksense 76" feature recommendations by independent book dealers nationwide. Three received the “Outstanding Fiction Award” from the Alabama Library Association. Down Home Press published a collection of his non-fiction work, Coming Home: Life, Love and All Things Southern, in October, 2000. Inman is the author of eight stage plays. His latest, Liberty Mountain, a story of the Revolutionary War battle of Kings Mountain, is performed every summer in Kings Mountain, NC. His other plays are Crossroads (musical comedy, 2003); The Christmas Bus (holiday, 2003); Dairy Queen Days (comedy/drama, 2005); The Christmas Bus: The Musical (holiday musical, 2006); Welcome To Mitford (drama, 2007); A High Country Christmas (holiday, 2008); and The Drama Club (drama, 2009). Inman wrote the book, lyrics and music for the two musical productions. All are published by Dramatic Publishing Company and are being produced by theatres nationwide. Novello Festival Press published an illustrated book version of The Christmas Bus in 2006. He has written screenplays for six motion pictures for television, two of which have been “Hallmark Hall of Fame” presentations. His script for The Summer of Ben Tyler, a Hallmark production, won the Writers’ Guild of America Award as the best original television screenplay of 1997. His other Hallmark feature was Home Fires Burning, a 1989 adaptation of his novel. Inman is a Phi Beta Kappa graduate of The University of Alabama with Bachelor of Arts (Communications) and Master of Fine Arts (Creative Writing) degrees. He is a member of the Authors Guild, Writers Guild of America, Dramatists Guild, PEN American Center, North Carolina Writers Conference, North Carolina Writers Network, and Alabama Writers Forum. Inman and his wife, Paulette, live in Conover and Boone, North Carolina. They have two daughters: Mrs. Larkin Ferris of Carolina Beach, NC; and Mrs. Lee Farabaugh of Frisco, TX.